For some time now the Canada New England trade has been suffering from the misperception that it is best to go there in September and October for the “autum leaves” when in fact the region enjoys a wonderful spring and summer season that starts in May. This week, we look at how Holland America is leading the way to extending the cruise season at Montreal and Quebec while others such as Crystal Cruises and Royal Caribbean are starting to offer round trip cruises from Montreal and Quebec. Meanwhile, after the demise of Classic International Cruises, the Australians are looking at phasing out their Travel Compensation Fund, but with what replacement? Elsewhere, two of the Royal Caribbean brands, Azamara Club Cruises and Pullmantur, are adopting blue hulls and new colours. For many decades, in the days before air conditioning, the St Lawrence cruise season ran all summer long. From 1919 until 1965, Canada Steamship Lines offered weekly Saguenay cruises from Montreal, with a season that ran from June to September, even during the war. From 1921 to 1961, the Clarke Steamship Company offered Gulf of St Lawrence and Labrador cruises in an even longer season, from May through October. These local operators were replaced in the 1960s by lines such as Cunard Line, the Baltic Shipping Company, Polish Ocean Lines, Moore-McCormack Lines and the Greek Line offering week-long cruises from Montreal and 10/11-night cruises between New York and Montreal. Six Days’ Cruise 1400 miles for $18. From Union Wharf, Boston, every Tuesday and Saturday, 12 noon for Halifax, Hawkesbury and Charlottetown. Good board. 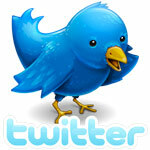 Cheapest rates. Best trout and salmon fishing, and shooting. Beautiful scenery. This doesn’t half tell it. Send stamp for booklet “Looking Eastward,” maps, etc. The Quebec Steamship Company’s 2,162-ton Trinidad followed in 1908, the 300th Anniversary of the founding of Quebec. In 1919, this line was acquired by Britain’s Furness Withy, who operated first the 5,530-ton Fort Hamilton and and then the 7,785-ton Fort St George between New York and Quebec City. Between the wars, the Anchor Line, Canadian Pacific, the Clyde Line, White Star Line and others all offered cruises between New York, the Maritime Provinces, Quebec and Montreal. These cruises were nearly always offered in the high season in July and August, when it was hottest in the cities, as getaways from the summer heat. In recent years, however, the so-called Canada New England brand has suffered in that even The Sunday Times now tells people who want to cruise the St Lawrence to go in the autum. The question is, is this the propogation of a myth or is it simply because cruises only go there now in the autumn? This has been one of the biggest problems for St Lawrence and New England destinations in recent years, but things are slowly starting to change. In recent years, Holland America has operated one ship, the 1,266-berth Maasdam, into Montreal between May and October. Starting this autumn, however, it brought a second ship to the St Lawrence, in the 1,348-berth Veendam, which had previously been operating on the New York-Bermuda run. Next yearHolland America will bring in the Veendam for a full season of St Lawrence cruises, from May through October. 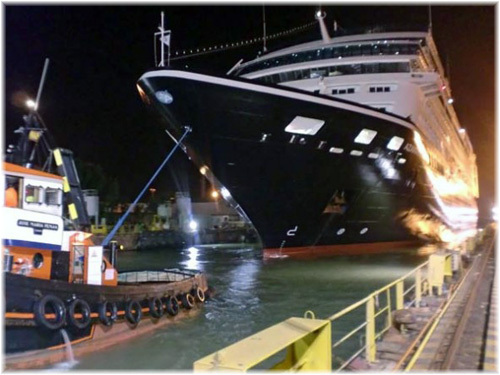 The Veendam will turn at Quebec while the Maasdam continues to turn at Montreal. Moving the Veendam to St Lawrence cruising is interesting in two ways. First, Holland America has already let it be known that it thinks it can make more money trading to Canada and New England than in what was once regarded as the lucrative Bermuda cruise market. Secondly, with the imposition of the North American Emission Control Area (ECA) this summer, the Veendam is actually going against the flow. When sailing to Bermuda the Veendam spent most of her time outside the 200-mile ECA limit but by sailing to Canada she will always be within it. This means she will have to burn more expensive distillate fuel in order to reduce sulphur emissions, something that Holland America has already estimated increased their fuel costs by 40% in the Alaska trade, which is also completely within the ECA, for an extra $200,000 on a 7-night cruise. The Veendam will add eight turnarounds at Quebec, bringing more than 20,000 extra visitors a year over a three-year period. Under a new marketing agreement, Montreal will also see extra turnarounds from the Maasdam in July and August. This program, announced last month, is backed by $1.15 million in government funds, half from Tourism Quebec and half from Quebec City. Included in the Veendam’s new program will be four 14-night round trips from Quebec that will call at Charlottetown, Sydney, Halifax, Bar Harbor, Boston and the Saguenay. Equally, the Maasdam will offer seven 14-night round trip cruises from Montreal calling at Quebec, Charlottetown, Sydney, Halifax, Bar Harbor and Boston. Both itineraries will also be available as one-way 7-night sectors between Montreal and Boston and Quebec and Boston. As part of this agreement, the 450-berth Seabourn Sojourn, operated by Holland America affiliate Seabourn, will also operate three St. Lawrence turnaround cruises from Montreal that will visit seven ports in Quebec: Montreal, Quebec City, Trois Rivières, Saguenay, Baie Comeau, Gaspé and the Magdalen Islands. Holland America has become a bit of a pioneer in the St Lawrence. It was the first cruise line to visit Sept Iles, on the St Lawrence North Shore, when it sent the Maasdam there in May 2009. This in itself was an earlier season start than usual for the St Lawrence, the call having been made during a positioning voyage from Fort Lauderdale to Montreal, something it will offer again in 2013. The new $20 million berth at Sept Iles now accepts cruise ships of up to 985 feet in length. Fellow North Shore ports Baie Comeau to the west and Havre St Pierre to the east have also added cruise facilities and their proximity to Gaspé on the South Shore, Charlottetown in Prince Edward Island and Corner Brook in Newfoundland, offers a choice of half a dozen cruise ports in the Gulf of St Lawrence below Quebec. The Magdalen Islands, which has its own weekly cruise ferry operation from Montreal and is now also visited by Crystal Cruises, adds a seventh. Carnival Cruise Lines has also been expanding into the Canada New England trade. While an earlier plan to cruise into the St Lawrence River was stillborn (the itineraries were cancelled at the last minute), this summer the line put the 2,974-berth Carnival Glory into the short cruise trade between Boston and the Maritime Provinces, offering a dozen 4- to 7-night cruises in June and July, which brought 85,000 additional passengers. On September 30, Crystal Cruises operated a 7-night round trip from Montreal with its 960-berth Crystal Symphony. Three of her four ports of call, Sept Iles, the Magdalen Islands and the French islands of St Pierre et Miquelon, were first time calls for Crystal. 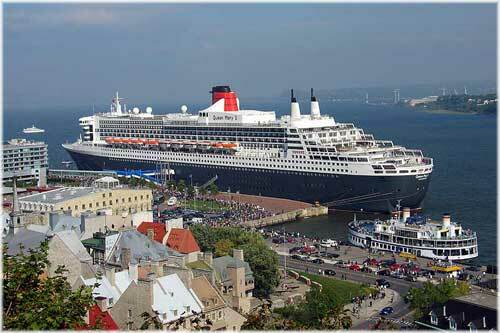 The fourth port, Quebec, has been rated as the most popular cruise port in North America. This Montreal round trip itinerary will be repeated on September 26, 2013. 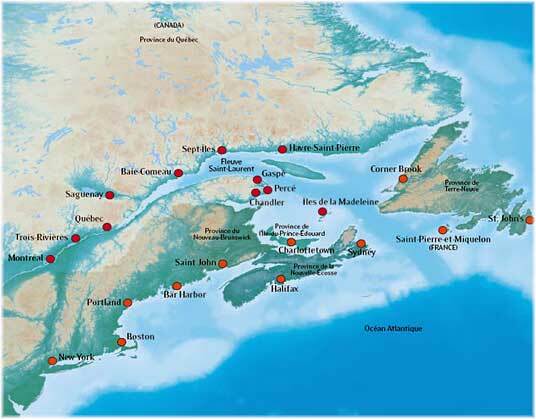 But in September 2014, this cruise will be offered by the Crystal Serenity from Quebec. A larger ship than Symphony, the Serenity presumably can’t get under the Quebec Bridge to sail upriver to Montreal. Royal Caribbean International has also started operating turnaround cruises from Quebec with its 2,112-berth Brilliance of the Seas, with a typical 10-night cruise taking in Baie Comeau, Corner Brook, Halifax, Sydney, St Pierre et Miquelon and Charlottetown. Like the Serenity, the Brilliance is also to tall to fit under the Quebec Bridge. Other St Lawrence visitors this season have included the 3,114-berth Emerald Princess, 2,104-berth Eurodam, 2,476-berth Norwegian Dawn, the 2,620-berth Queen Mary 2, the 684-berth Regatta, 490-berth Seven Seas Navigator, 388-berth Silver Whisper and the Veendam, nearly all in September and October. Not to mention the Aida, Fred Olsen and Saga ships that cruise over from Europe. Backing all these marketing efforts is the annual “Cruise Canada New England Symposium”. 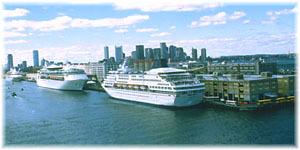 The first was held in Saint John NB in 1999 as an initiative of the Atlantic Canada Cruise Association and was so successful that the St Lawrence Cruise Association hosted another one in Montreal in 2000. Since then, Boston, St John’s NF, Quebec City, Bar Harbor, Halifax, Charlottetown, Portland, Saguenay and even New York have all shared the annual event, with Montreal, Quebec and Saint John each having hosted it twice. The event is normally held in May or June, which is a subtle way of emphasizing that the good weather starts earlier and the season for the Gulf of St Lawrence, Maritime Provinces and New England is longer than just September and October. Abolish consumer protection you say? Well, the idea is to replace the existing fund with something that has not yet been defined. But with the recent demise of Classic International Cruises now is perhaps not the time to be fiddling with consumer protection. According to Carnival Australia, without an appropriate replacement travellers could be left with limited protection. Part of the problem seems to be that travel agents must presently pay for the fund and the strongest do not like the idea that they are paying for the failure of the weakest. But credit card protection plans are not seen as adequate as not everyone pays that way, and most travel insurance policies do not cover insolvency of travel suppliers. Australian Consumer Affairs ministers will be discussing a Draft Travel Industry Transition Plan when they meet on December 7 to determine a course of action. Meanwhile, in the case of Classic International Cruises, the Australian Commissioner for Consumer Protection has said that there are several avenues for affected passengers to try to secure a refund, including (a) passengers should determine whether funds have been transferred by their agent to the cruise line (b) the existing Travel Compensation Fund (c) contact the administrator Lawler Partners to register as a creditor (d) check with their travel insurer to see if they are covered and (e) passengers should contact their credit card provider if other avenues are not open to them. First came news from Azamara Club Cruises that it would be changing the hull colour to blue on the 716-berth Azamara Quest, which has just been redelivered in Cadiz, and the 676-berth Azamara Journey, which will follow in Singapore. 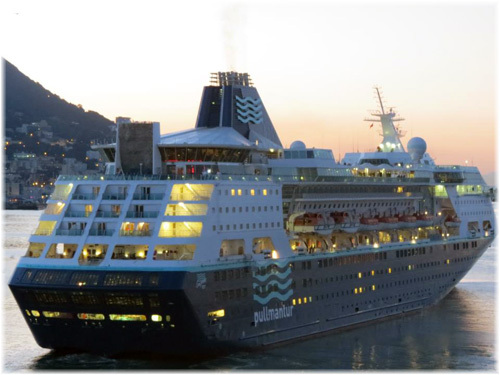 Now comes news from Pullmantur Cruises that it is also adopting a new blue-hulled livery for its fleet. The 1,600-berth Empress has already been delivered and 2,306-berth Sovereign was last reported acquiring a blue hull on dry dock in Malta. These ships follow the Horizon, which first acquired a blue hull when she went to Croisières de France earlier this year. Presumably there are some savings for the two brands in terms of maintenance and appearance, but in the case of the Azamara ships it is a return to the old livery of their original owner Renaissance Cruises. The original Royal Caribbean-associated cruise brand was of course TUI Cruises, so this will bring to eight the number of blue-hulled ships in the Royal Caribbean group, nine if we include the Celebrity Xpedition.